The three young gentlemen soldiers were gone before the sun rose the next morning. Robin wasn’t sure how it happened, but by noon, the entire village knew of the attack on Elizabeth the night before. Perhaps not as surprising was the way the number of attackers grew as the tale was told. And with each telling Robin’s and Dean’s stock in the village grew. The villagers weren’t ready to embrace the pair as their own. But they were more willing to accept them. A little over a week after the attack, Robin accompanied Elizabeth to the church to deliver some cheese to the pastor. As they approached the square, where the village well was located, Robin heard the familiar hiss of children whispering behind her. Screaming, the children scattered, giggling as they pushed each other out of the way. “You’ve gotten quite popular,” Elizabeth teased. Elizabeth laughed. The sound of another young woman’s laughter echoed. It belonged to Mistress Mary Smith, the tinker’s daughter. Standing next to the well, the pleasantly plump young woman was just dropping the last of a bit of laundry into her basket. “Good day, Master Parker, Mistress Wynford,” she said. There was barely a flush in the eastern sky when Dean felt Robin prodding him awake the next morning. He grumbled, but it was quickly clear that his sister was in no mood to put up with his complaints. Not sure what was bugging her, he followed her out of the barn and on to their first task of the day, setting the rabbit traps along the nearby stream that flowed between the fields and a small glade of trees. 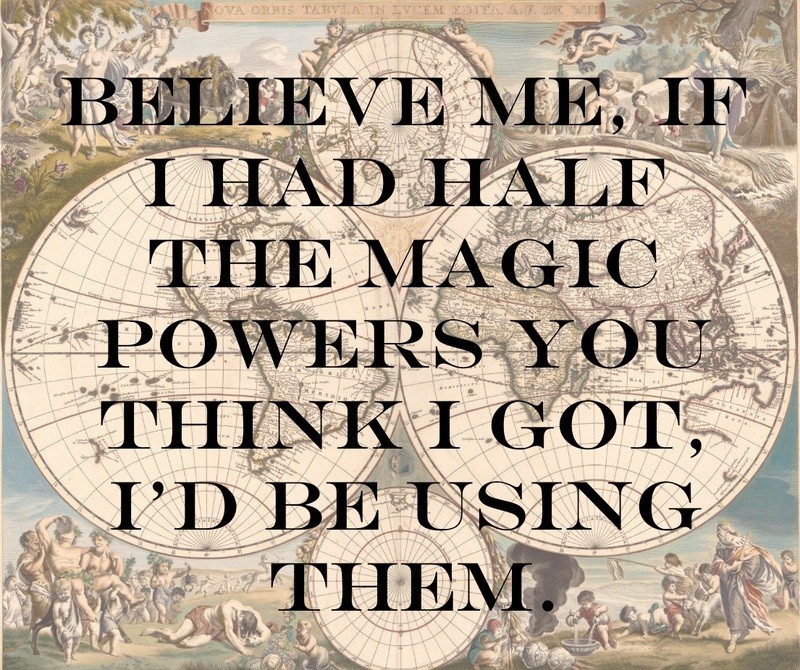 Robin kept muttering about the time, and sure enough, the King’s messenger and Master Black were already awake and waiting by the time Dean and Robin got back. But it didn’t take long to set up the table for their breakfast. In the meantime, Master Black took some bread and his horse and left quickly. Robin and Dean joined Mistress Ford and Elizabeth in the kitchen to eat the porridge that Elizabeth had prepared. Then Dean was sent to bring out the King’s messenger’s horse, Elizabeth to tend to the now empty rooms, and Robin to take down the table in the common room. Mistress Ford went to milk the cow, which apparently refused to milk for anyone else. Dean had the horse saddled and ready by the time the messenger had eaten but got no thanks as the man mounted and rode off. Mistress Ford had also told Dean to clean the stables once the messenger was gone, and so Dean turned to his task. The mess that was the stable overwhelmed him as he stood in the doorway. His stomach grumbled with hunger and he grumbled about how miserable it all was. He was still grumbling when Elizabeth came out to the stable, looking for an extra broom. “Doesn’t anybody, like, rest or something around here?” he said, tossing straws from the bench he was reclining on. Elizabeth pursed her lips and avoided looking at him. 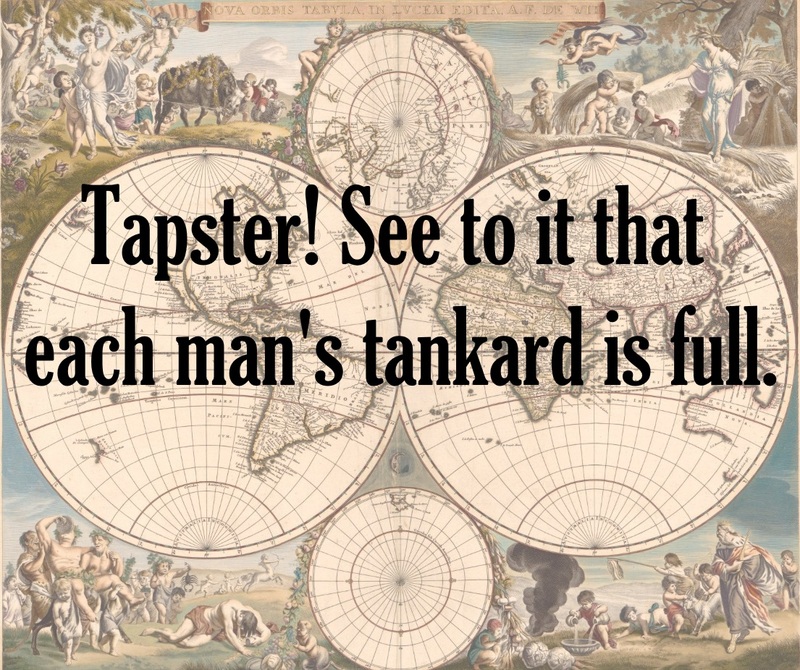 I love fonts – what we used to call typefaces back in the day when people actually set type. I love going through the bazillions out there, testing first this one, then that. Debating whether I want to go with serifs or without. And I do have some absolute faves. 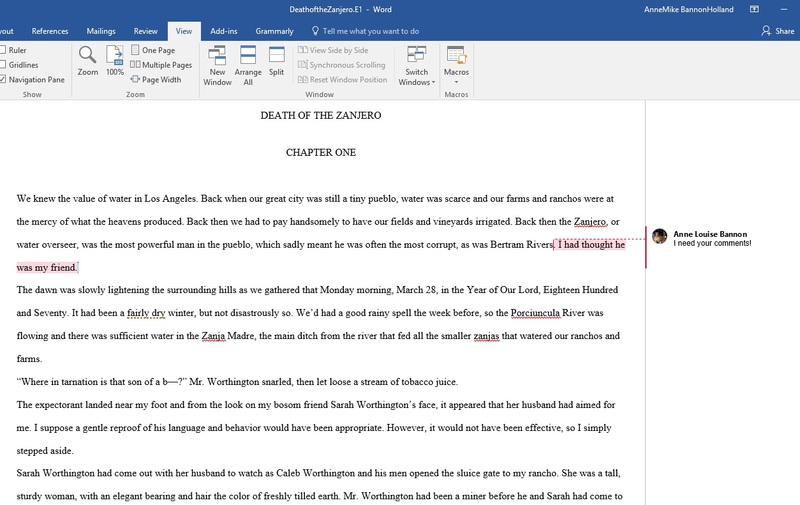 Now, I am aware that it is not normal to have a favorite font. It’s not normal to have a favorite Shakespeare play, or a favorite character (Puck) from my favorite play (A Midsummer Night’s Dream). And if you really want to see someone’s eyes glaze over in record time, start getting excited about file folders. I’m a strict third cut tab person, by the way. Normal has never been my thing. 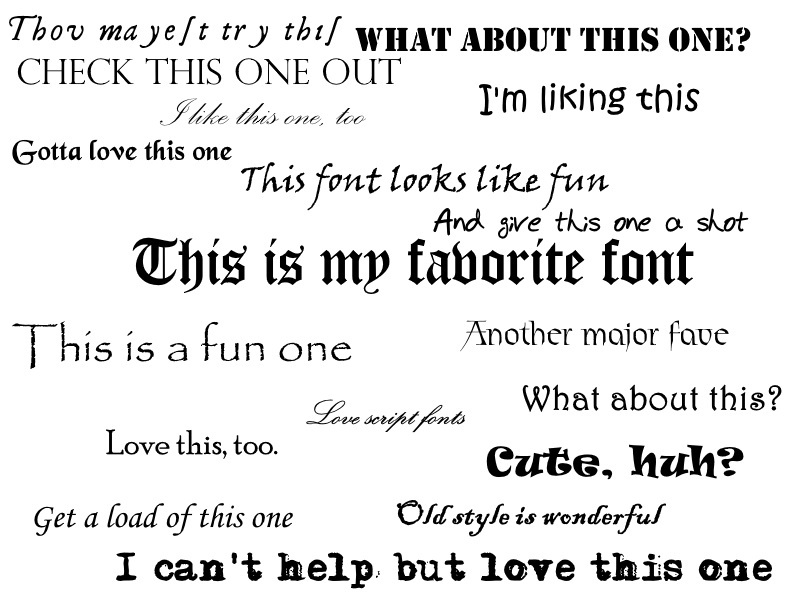 So I’m cool with loving fonts. The only thing that makes me sad is that I can’t usually use my favorite fonts on my business cards or as website headers because most people can’t read them. Kind of works at cross purposes, you know? But you wait. One of these days, I’m going to find a way to use Diploma on something that isn’t a diploma. I will. I will. I will. It took almost two weeks to get all the information and clothes that Robin wanted before she felt satisfied that she and Dean were ready to make the jump into the past. The clothes had been the hardest part. Robin made contact with a historical re-enactor through an e-mail friend of hers. The re-enactor helped her find outfits through her group but was remarkably picky about authenticity. Oddly enough, Elizabeth wasn’t, and in fact pronounced several doublets and breeches as workable that the re-enactor turned her nose up at. Dean, for his part, complained incessantly and tried again and again to interest Elizabeth in modern life. Again and again, Elizabeth reacted in fear or distaste. She refused to flush a toilet, although she liked toilet paper once she got the hang of it. Dean’s favorite alternative rock and hip-hop groups made her shudder. She refused to wear any less than three layers of clothes and clung tenaciously to her stays. Daily showers were a struggle. Robin and Dean had to be very sure to keep her away from television sets because the “elves in the box” would start her screaming. And while getting her on the Underground was difficult enough, the only thing worse was driving the magic carriage. Even eating was difficult. Elizabeth would not eat anything that came in a Styrofoam container because she hated the feel of the foam. That made ordering food in almost impossible. But getting her through the streets to restaurants was pretty much running the poor girl through a gantlet of terrors. The worse part was that Robin insisted the three stay moving to make it harder for Roger to track them. Furthermore, Elizabeth begged not to be left alone in whatever hotel room they were in after the first day because the phone had rung and scared her. Still, Dean persisted, but as the two weeks wore on, his protests became less strident. Finally, Robin was satisfied. The night before the three were to leave, she had hers and Dean’s luggage shipped to her office. All they had that night was what they could carry in the two homespun bags they would bring with them into the past. The next morning, Dean made one last pro forma protest as he tested his saber. “Are you sure about this, Robin?” he asked, swishing the sword through the air as he lunged forward. “Put that damn thing down before you hurt one of us.” Like her brother, Robin wore a shirt, breeches, doublet, boots, wide belt and plain, dark cavalier hat. “I’m not going to hurt anybody,” Dean grumbled, sheathing his sword nonetheless. “I am,” said Elizabeth, her eyes shining with joy. “I s’pose,” Dean grumbled as he picked up his bag. 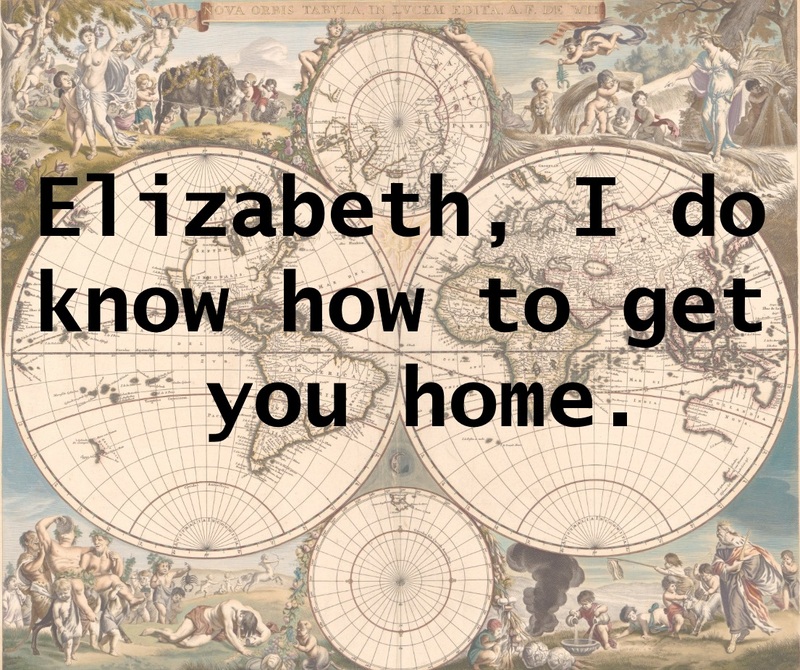 “Oh, dear,” sighed the matron as she looked Elizabeth up and down. Robin held her breath as she and Dean stood in the doorway to the castle. She glanced over at Elizabeth, who looked more curious than frightened at the moment. Dean was putting on his best “bluff ’em out” look. Elizabeth looked puzzled, but before she could say anything, Robin gently took her arm and turned her toward the parking lot. 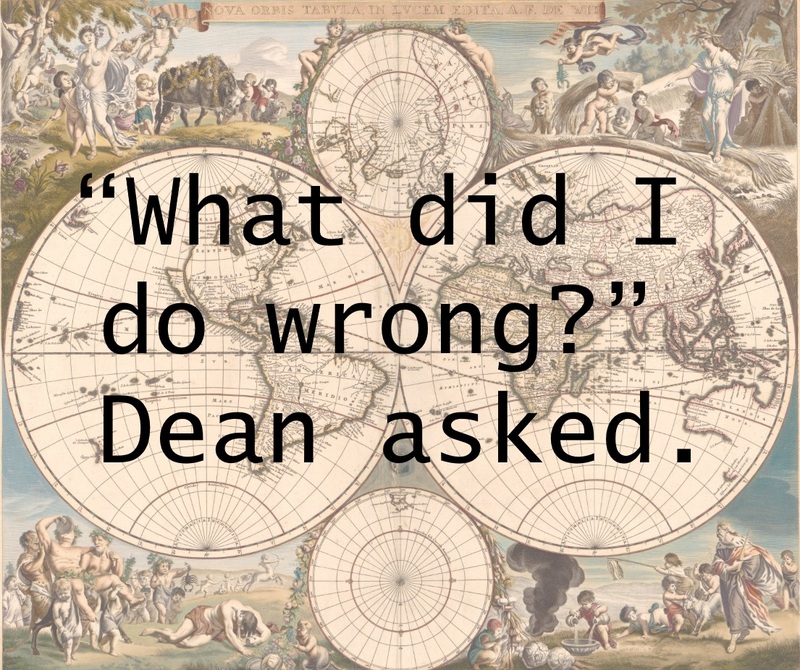 “Huh?” asked Dean, following close behind. “I don’t get it,” Dean said. This is a project I’d had in the back of my mind for… Well, years. My husband had worn out the legs on a pair of bib overalls, but the bib, itself, was in pretty good shape. Thinking about what I could do it with it more or less got me started on my latest “thing,” if you will: remaking new clothes out of old ones. Michael and I will wear our clothes to rags. Donating the old clothes to charity doesn’t really help the charity because who wants to buy a shirt with ragged collar and cuffs? Yet, all too often, it’s just the collar and cuffs that are frayed and messed up, but the rest of the shirt is fine. Or the really ugly hole in the jeans is just in the one impossible to patch spot, but the rest of the pants are fine. 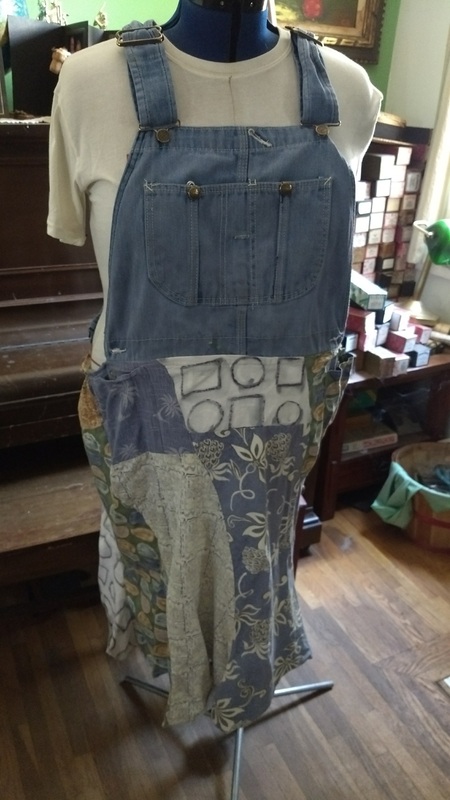 I have been making bags out of jeans where I’ve cut off the legs (working on turning those bits into yarn) and using old shirts for the linings. But a whole dress or something? Not there yet. Or I wasn’t. Frankly, I just finally got off my keister and put together the skirt I’d been thinking about for so long. It took seven shirts. I used a pattern piece for a gored skirt from an old Burda magazine (August 2007, French Edition, long story). The piece was too big for the backs of the shirts, so I had to squiggle it around on the front and make each of the skirt gores out of two pieces of fabric. Since I was doing that, I decided to add more color and mix and match the different shirt pieces. 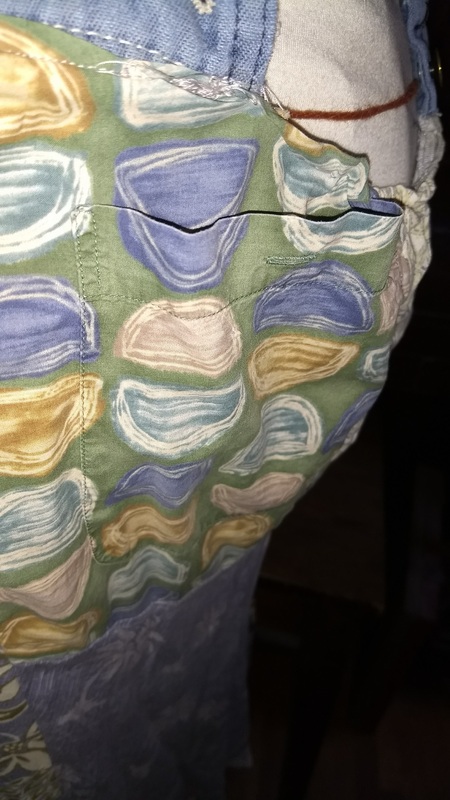 I didn’t know if it would save any actual sewing, but since the shirts – mostly Hawaiian and other casual short sleeved ones – had pockets, I used the former shirt pockets for my skirt pockets. I would have liked a fuller skirt with more body, but it still looks okay and is darned comfy to wear. I don’t know if I’ll try this project again, but I do have another dress that I recently finished that I’ll feature here eventually. And another, more structured, dress project, too. Then there’s the crazy quilt top I’m working on. And so it goes. 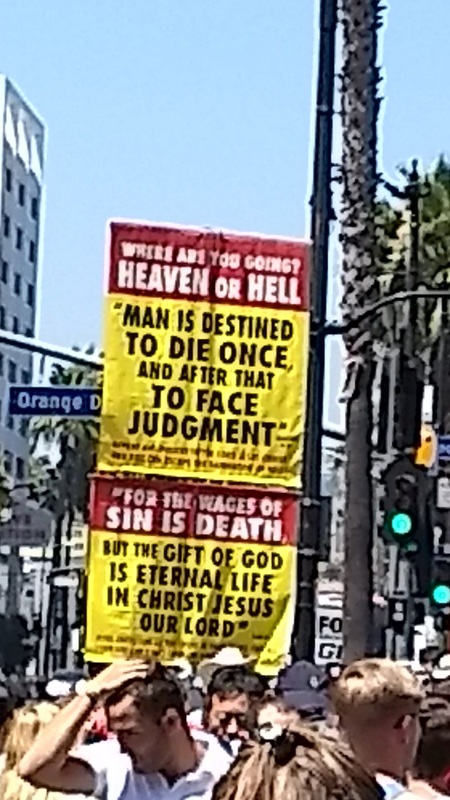 Evangelizers on Hollywood Blvd. recently, and, yes, they ignored all the homeless people nearby. Several months ago, I was waiting for a bus across the street from the L.A. City Hall when I saw a group of about five or six young women, all wearing the same bright green t-shirt, surrounding an old Hispanic woman sitting on the next bunch. One of the green-shirts was seated next to her, talking earnestly at the old woman. You could tell the old woman was nervous – as who wouldn’t be? Another group of green-shirts, guys, was nearby and I saw the small pamphlets on the ground and realized what this group was up to. They were evangelizing – as in trying to get people to convert to Christianity. It’s bad enough when someone is being kind and sincere about sharing his or her faith. It’s bad enough when I tell these people that I am a Christian, and that, yes, I’ve said the magic prayer, but they still keep at it. What really got me torqued off at this group was that right across the street, the north lawn of City Hall was dotted with homeless people. Were any of the green-shirts over there, handing out sandwiches and clean socks? Maybe sitting and listening to somebody? No. They were all gathered on the side of the street I was on, molesting an old lady. I got mad and called them on it. One sweet young thing told me they were praying for the homeless people. I made an allusion to the Epistle of St. James, chapter 2, verses 15-17 (you know, what good does it do tell someone naked to dress warmly and be well and walk by him) and got on the bus. I’ve been trying to find a way to write about the incident with the compassion and love I was really not feeling for these people ever since. See, the thing is, most people out there stumping for Jesus are doing so thanks to their pastors, who are playing the guilt card, big time. They tell their flocks that if they really cared about people, they’d make sure they heard the Gospel, how unkind it is not to evangelize, etc., ad nauseum. And you can’t entirely blame the pastors. Not only are they hearing the same message, they’re looking at their shrinking Sunday collections and either consciously or unconsciously (I suspect the latter) figuring they’d better put the pressure on to bring in some new bodies. The problem is, that same zeal is exactly why those Sunday collections are shrinking. People simply don’t believe in churches anymore. We can go into the whole Millenials are disaffected routine, and that does play a part. But I strongly suspect another part is the narrow-minded self-righteousness of people like the green-shirts, talking about the love of Jesus, but completely ignoring the hungry people across the street. This bothers me because I happen to think that this planet would be a great deal better off if Christians (including me) really tried to practice the love of Jesus instead of talking about it. And it is practicing. None of us gets it totally right. Practicing the love of Jesus is about being present to other people, not quintuple-teaming an old lady until she says your prayer. It’s not worrying about the state of other people’s souls, but staying focused on the state of your own. If someone is genuinely searching and wants to hear about your faith, great. Be ready. But Jesus’ final directive of making disciples of all nations may actually mean he wants multi-cultural representation (in which case, we’ve met that goal – there are Christians pretty much everywhere), not that he wants everyone to become a Christian. I can’t say for sure. All I can do is keep trying to be kind and present and loving to everyone, from my husband at his most annoying to the smelly bum sitting next to me on the bus. And give money to the poor. Maybe remember to buy an extra package of clean socks for the local homeless shelter. Carrying a few extra fruit bars in my backpack to share with anyone who asks. And probably a few other things I should be doing. And I’ll keep praying for the green-shirts, too. Why not? Wow. That went fast. 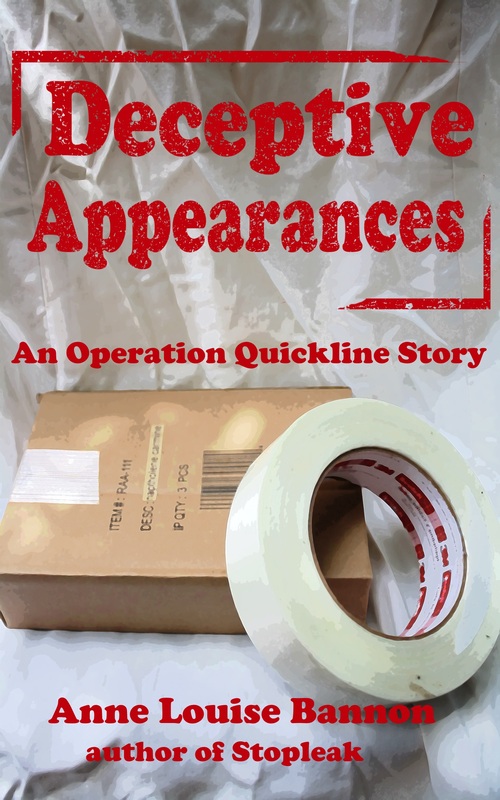 Just like That Old Cloak and Dagger Routine and Stopleak, Deceptive Appearances is now a full book. You can check it out on its own special page under the Operation Quickline menu. I hope you’ve enjoyed the series so far. If you have, I’d love it if you’d write a review on GoodReads or one of the other retail sites. It really makes a difference when you do. I’m going to take a week off to make sure my next serial project is even better. It will debut this space on Friday, August 25. 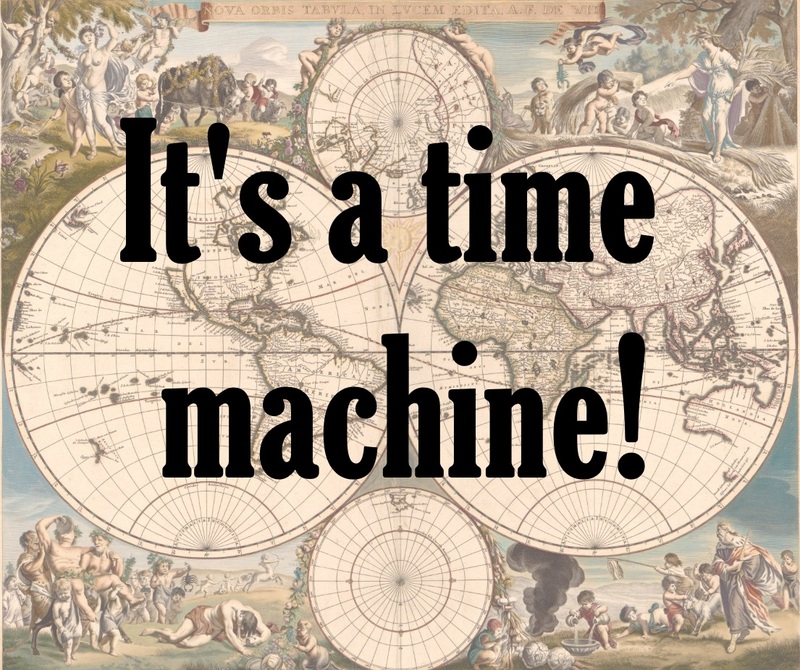 It’s something very different from my usual cozy mystery bent – a time travel novel called But World Enough and Time. Robin and Dean Parker discover a young woman in a closed-off room of an abandoned castle. When Robin can’t resist the temptation to test the equipment in the room, she realizes that it’s a time machine and Elizabeth has been in suspended animation for almost 400 years. After Robin accidentally takes the machine with her, she realizes that she and Dean need to return Elizabeth to her own time. Thus the three embark on an amazing adventure through history with not one, but two, time travelers on their tail.